Allens Party Mix contain an assorted mix of Allens lollies. 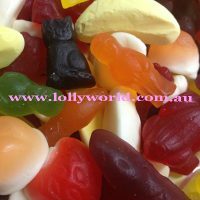 You will find some lollies in this pack they don’t sell on their own anymore. My favourite would have to be the peaches and cream. I also like the little red frog, the extra large snake and the cola bottle. There probably isn’t a lolly I don’t like. The black cat. I don’t like the black cat.